The best advice I can give to all incoming freshman and transfer students is to join some type of club on campus. Joining a club on campus is the easiest way to meet new people and in my opinion is vital for getting the full college experience. With that being said, there are organizations on campus for everyone. Whether you are interested in joining a sport, joining the Anime and Video Game Club, or joining the Business Management Club, there are various types of organizations and clubs for everyone. But, there is no doubt that out of all the organizations on campus, fraternities and sororities have the biggest events and the biggest presence on campus. Greek life, meaning fraternities and sororities, is very different from the stereotypes you are probably thinking about. Students in Greek life do still have events like formal, but nothing crazy like you see in movies. Greek life at Farmingdale is mostly about hanging out with a group of your closest friends that you call your brothers/sisters. One major thing Greek life at Farmingdale also focuses heavily on is philanthropy work. Every year one of the fraternities at Farmingdale, Tau Kappa Epsilon (TKE), holds a car smash to raise money for drunk driving awareness. This fraternity gets a car donated that was involved in a drunk driving accident and students hit the car with sledge hammers. All money raised at this event gets donated to an organization that raises awareness of the dangers of drinking and driving. 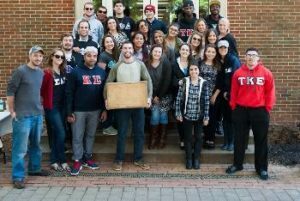 This fraternity, Tau Kappa Epsilon, raises $5,000 for charitable organizations every year. Between all the Greek organizations at Farmingdale, thousands of dollars have been raised for a variety of different charitable organizations such as St. Jude Children’s Research Hospital, Prevent Child Abuse America, the Pancreatic Cancer Lustgarten Foundation, St. Baldrick’s, the Military Heroes Campaign, and dozens of other charities. Fraternities and sororities do a lot for the community. The experience you gain setting up these philanthropy events is something that will help you throughout your life. A lot of people say a fraternity is like a business and that couldn’t be more true. Many times as a representative of your Greek organization you will be marketing yourself and your organization to local businesses. The Stuff-A-Bagel across the street from campus even has a sandwich named after one of the fraternities on campus. In many ways the experience you gain in Greek life can be used in your career. If you don’t believe that a fraternity/sorority can help you with your career then let’s look at some of the distinguished alumni of Tau Kappa Epsilon, one of the fraternities at Farmingdale. Steve Forbes, business man and owner of Forbes magazine; Edward Droste, founder of Hooters restaurant; Les Paul, guitarist; Elvis Presley, entertainer; The Big Show, professional wrestler; Aaron Rodger, Phil Simms, and Terry Bradshaw, NFL football players; Roy Jones Jr., professional boxer; and most importantly Ronald Reagan, 40th President of the United States. Before they were legends in the business, athletic, and entertainment industries, they were in Greek life. During my freshman year I attended an informational with a few other students who were interested in joining a fraternity. At this informational, current brothers were answering any questions we had and told us more about the fraternity. One thing they said that always stayed with me is how they explained that these will be your brothers for life. Specifically, the president said, “Look to your right, look to your left. The guy sitting next to you will be the best man at your wedding, the godfather to your kids, and your brother for the rest of your life.” At the time, those brothers who were giving the informational were founders of the fraternity and they were only in their junior year. I thought since the founders would be the oldest brothers and they were only in their junior year, what do they know about being the best man at a wedding or being the godfather to someone’s kid? Although at the time no brothers were married and no brothers had kids yet, two years later the first of our brothers got married. Although it was a very bold statement to assume that we would all be the best man at each other’s wedding, it ended up being a true statement. For our first and only brother to get married so far, the best man at his wedding was a brother from our fraternity. It isn’t an exaggeration when we say the friends you meet here in Farmingdale Greek life will be friends that you will have for the rest of your life. For all the reasons mentioned, getting involved in Greek life is a decision you will be glad you made. Your college career is about to be a life experience would will never forget. The best four years of your life start now. As President of the Greek Council and on behalf of everyone in Greek life, welcome to Farmingdale.